Click on the scheduled online/video session you’d like to start. You will be brought to your session details. Sessions that have been booked for online/video chat will have a Start Session button in the top right corner. Click here to start your session. Even though your video conference page has opened, you still are not in an active session. Once you are situated and ready for your session to begin, click on Start Session at the top right-hand corner of your screen. Your session will be underway once your client has also accepted your request to join the session. In your session, you have options to mute yourself, turn off your video streaming (or switch cameras), show your chat and share your screen. If you’d like to mute yourself so that participants can’t hear you, simply click on the microphone icon at the bottom of your video conference screen. You will see a line through the microphone when it is muted. To unmute, hit the microphone icon again. If you’d like to turn off your video camera so that participants can’t see you, simply click on the video camera icon at the bottom of your video conference screen. You will see a line through the video camera icon once your video camera is turned off and you won’t see a live stream of yourself on your screen. To turn your video camera back on, hit the video camera icon again. 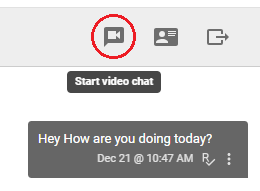 Click on the chat icon at the bottom of your video conference screen if you’d like to display your chat for this session. Once chat is open, you can type into the chat field to communicate with client in real-time. If you’d like to hide chat, click on the chat icon again. The chat window appears on the right edge of the screen on desktop and in a popup window on mobile devices. Share your screen by clicking the Share Screen button at the top right-hand side of your video session. Select the screen you’d like to share and click Share. When you’d like to stop sharing your screen, simply click Stop screen sharing. Learn more about sharing documents during video chat sessions. Note: The first time that you want to share your screen you will be required to download a Google Chrome Extension that is required for Practice Better Telehealth to work. See more details about this here. After clicking the Share screen button, you will be prompted to select a screen to share in the top-left corner. Select your screen then click Allow to begin your screen share. If you’d like to maximize your video session to fit your screen, click on more options (three dots) at the top right-hand corner of your screen and select Full Screen. Click Exit Full Screen when you’re ready to go back to your regular viewing screen. To end a video session, click on the red Exit icon at the bottom of your screen. Ending a session is only available to practitioners. You’ll notice that you can also launch a video chat from your Messenger. From any chat screen, you’ll find a video camera icon in the chat title bar. Click the video chat icon to begin a video session. Video chats launched from your Messenger work the same as explained above except they are not linked to specific appointments. If you’d like to use Practice Better Telehealth to run video sessions, make sure Use Practice Better for my online/video chat sessions is selected. This ensures that clients receive instructions to join their scheduled video session in their reminder emails. Within your session, you may notice the other participant is not seeing or hearing you. You can try adjusting the device(s) used to capture your audio and video by clicking on the Settings icon within your call. Your client will receive a notification to join the impromptu session. As mentioned, your client would need to be invited to join Practice Better and activate an account. If you decide not to see the client in the future, you can either deactivate or delete their client record from the system. Is there any way to record video sessions with clients so they can go back and rewatch the information shared? At the moment, we don't have support for recording video sessions, but it is something we're considering for a future update. I just tested the video tonight. What a great built-in feature! I agree recording would be a great option to have available. I'm taking a class that will require me to record and submit my sessions so that would be helpful. I would also like to have recording capability, otherwise I will have to use something like Zoom, which I would rather not have to do. My client tried to use the web-based telehealth from her cellphone and it didn't seem to be working. Is that normal? Maybe she should have used it from the app? I'd love to have recording as well. It's helpful to be able to listen to a session again afterwards sometimes - esp. if there's a lot of trauma/complexity for the client and you want to remain eye contact instead of typing notes. It would also be very helpful for conducting online programs that need a replay to be sent. Can you use the video chat for several people at once?